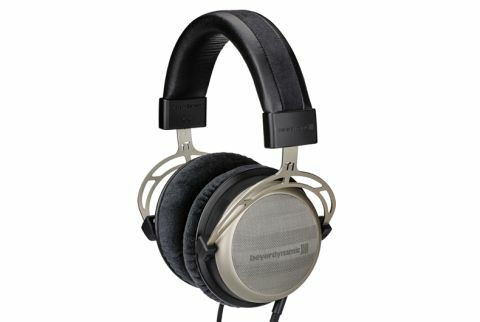 Beyerdynamic T1 Generation 2 review | What Hi-Fi? We reviewed the original T1 headphones back in 2010. They cost £880 at the time and stunned us with their performance. It was enough to see them pick up a Best Buy award in the high-end headphone category that year. Six years on and we have the Generation 2 version, and on first acquaintance little seems to have changed. The only visual differences are that the headband is now lined with leatherette rather than the real thing, and the cable – still 3m long but now detachable – is fully shielded and covered with a textile braid. They’re comfortable too. Compared to the original, the inward pressure is a little less, but remains enough to keep the headphones stable. Remember, these are intended for home use and not for wearing during exercise. The ability to swap leads not only means replacement is easy, but also opens up a balanced option. The move away from leather on the headband was prompted by durability and cost reasons. Yes, even headphones at this price level are subjected to budgetary constraints, though at least these Gen.2s are cheaper than the originals. Beyerdynamic’s engineers have tweaked the driver units to improve performance but the unusual semi-open enclosure remains unchanged. This, as the name implies, is a halfway house between traditional open and closed designs, resulting in an interesting mix of strengths. There’s the spaciousness of open-backed (with some sound leakage) alongside the substance we hear from closed designs. Compare the spec sheet of the two generations and there’s little notable difference, though the frequency response graph shows the new ones to have greater low-end heft and smoother highs. That’s not the way they present on initial switch-on though. The Gen.2s sound thin and bright, with a peaky response in the treble that grates with recordings that are anything less than immaculate. We’re a patient bunch and decide a weekend’s worth of running-in is required before we make any serious judgement. It turns out the best part of a week is needed before the G2s show their true colours. We’re glad we waited. Once they stabilise, these headphones take the insightful yet entertaining sound of the originals and add extra doses of resolution, transparency and low-end weight. All the while we still have a firm grasp of rhythmic information and the kind of fluid dynamics we rarely hear from headphones, even top-end models. Our listening sessions start off with Miles Davis’s So What and we’re impressed by the T1s’ ability to render fine detail. These cans capture the texture of instruments brilliantly and deliver the modulating but highly controlled intensity of Davis’s playing with precision. Instruments are not only defined well – leading and trailing notes are drawn with finesse, not hard edges – but rendered with convincing body and natural warmth. Tonally, there’s a touch of emphasis from the lower mid downwards and a touch of extra sparkle in the treble, but neither of these traits are excessive, and they don’t stop these headphones from conveying the music’s message authentically. Switching to Drake’s Headlines shows that the T1s have the ability to entertain as well as inform. They charge along, pounding out the rhythm track with enthusiasm. There’s plenty of attack here and a solid dose of low-end authority. Importantly, that bass power isn’t bought at the expense of agility or precision. Higher up the frequency range we’re impressed by the T1’s articulate way with vocals and the way they convey the dynamic nuances and varying pace of Drake’s delivery. With this track the Beyerdynamics turn in a complete performance that’s hard to pick holes in. The story is similarly positive regardless of the musical genre. There’s blood and thunder with Stravinsky’s The Rite Of Spring and the kind of spacious presentation that in our experience only the likes of Sennheiser’s excellent (and pricier) HD800S’s can better, though not by much. Yet, listen to Mount The Air from The Unthanks and the T1 Gen.2s deliver all the passion and heartache with considerable panache. All brilliant, but you won’t get this kind of sound simply connecting these headphones into any old Smartphone or DAC. To get this level of performance everything from the original recording to the source and headphone amp have to be top class. If you’re using a computer as source, we think CD-spec 16-bit/44.1kHz files are a must, as is good media playing software such as Pure Music (for Macs) or JRiver (PCs). As far as DACs/headphone amps are concerned, look at either the Chord Hugo or Naim’s DAC-V1. If you’re using a traditional hi-fi, consider the likes of Cyrus’s CDi CD player a good starting point. A good headphone amp from the likes of Graham Slee, Naim or Meridian is essential too. Get the rest of the system right and we can’t see the T1s doing anything less than impressing you. If you were after a pair of top-class pair of headphones without spending thousands, these – along with Sennheiser’s HD800Ses – would be our top recommendations. Get the rest of the system right and all you have to do is sit back and enjoy.